Mass Processing using GI - Acumatica Developers Blog . 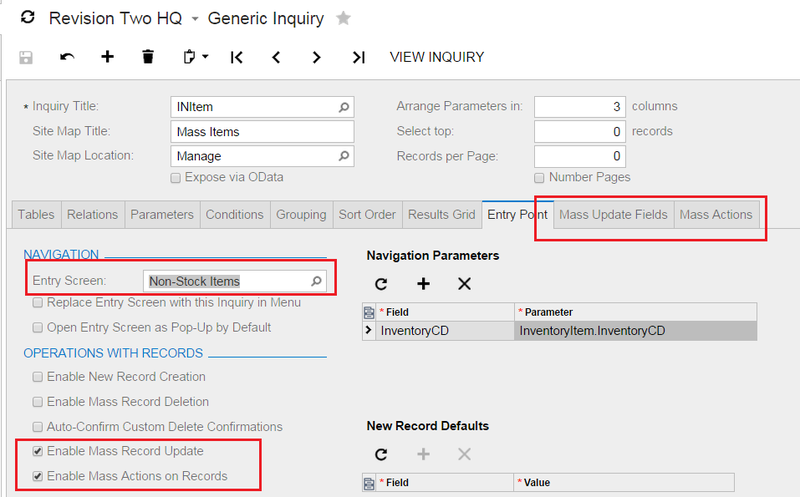 Lets assume that you have multiple records where you need to mass execute some action or update multiple fields to the new value. From the I100 Acumatica Integration Services Training course you may know that you can do it with Export or Import scenarios. Integration Scenarios are some sort of the small program inside your ERP where you can update multiple fields, calculate depended values, execute actions and so on. But what if you want to have more control on records need to be updated. Some sort of semi-manual mass updating tool? In this case Generic Inquiry Mass Update feature can be more interesting and useful. Lets try to use it. 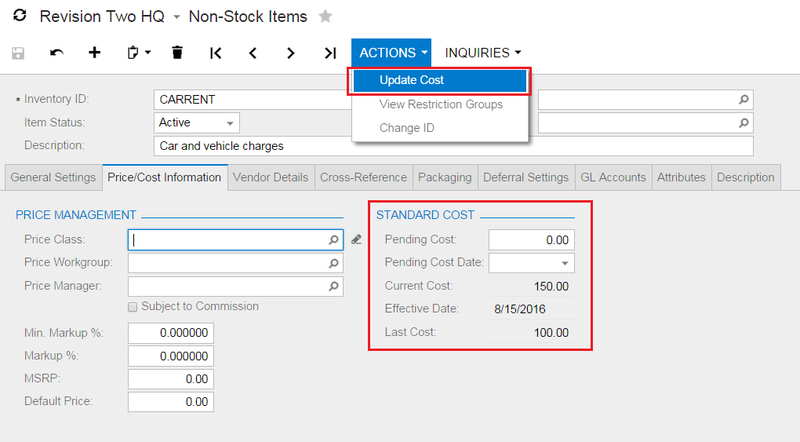 I will share with you example based on Non-Stock Inventory items and we will click Update Cost button for multiple records. Add field to result grid. On the Mass Actions select all actions you want to use. In my case it is just Update Cost. Please not that all actions will have 2 buttons – Action and Action All – to handle one an all records. You also can apply all required filters, conditions and other iterations on GI, so your mass processing will be as much interactive as it possible. I see what are you trying to do, but personally haven't tried it. Could you please create a case for that with acumatica? How can we add fields on mass update fields? I am trying to add FOB Point on Vendor GI and I cannot find the FOB point field in Mass Update Fields tab. There is some rules how new fields appears on "Update Fields" tab. For example field should be visible in UI and be enabled and be not read-only. You also cannot add fields from DACs other than primary.